Alpha FL Jacket - Mens is rated 4.8 out of 5 by 17. Rated 5 out of 5 by MSmiley from sickest alpine climbing shell jacket ever Most of the time my shell rides in the bottom of my pack, making minimal weight a big concern. This thing is stripped down, no frills, amazing piece. The hood is awesome, the fabric breaths really well. I dont really miss the pit zips cause when Im wearing it, its nasty out. Arc'Teryx nailed it. 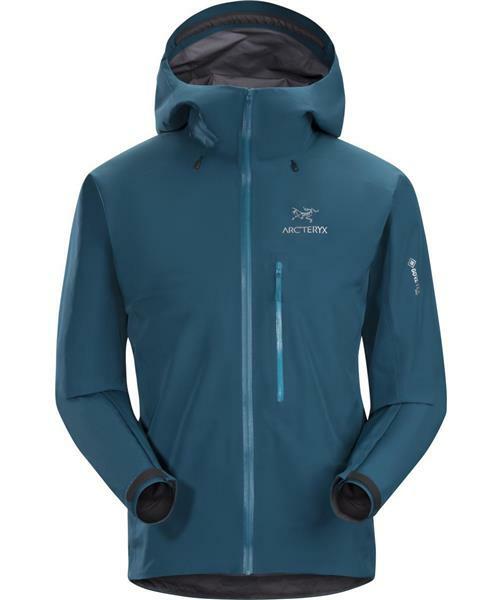 Rated 5 out of 5 by geminiteam from Most versatile shell Arcteryx sells This shell is extremely light, packs to a minimum, and breathes very well. It is just as suited for summer rain as it is for tree-riding in powder (with an appropriate bib pant and midlayer) or to pack as a rain jacket on a business trip. The cut is trim around the hips but generous in the chest and shoulders (I'm 5'9 148 lbs and of average build). The fabric has a fairly soft hand but a little crinkly. The one pocket is in the right location and a good size, easily fitting a passport and boarding pass. Very minimalist modern styling that works with just about any street clothing. The Carbon Copy is by far the most versatile colour but the Chipotle Orange and Mantis Green are also quite nice and the web-photos are true to colour. Highly recommended. Rated 5 out of 5 by Scot from In my opinion... The product line came highly recommended by my buddy, and after researching this product I made the purchase. To begin I am a athletic 6'0" 205 lb male who was not sure the Large would be the correct fit, but it was. I picked up this specific product after the competition had fallen short of my needs. I am an avid back country nordic skier, and on and off road cyclist. Much of my experience is when a product does extremely well on one aspect, it fails considerably on another. My major concern was will this product wet out in extreme weather, and will the material wick my perspiration adequately. Much to my amazement, it did both very well after testing it for several days out in the White Mountains of New Hampshire. During this outing I used a Patagonia Cap 1 Base Layer, along with a R1 Pullover. I was very impressed on how my body temperature was never too hot or cold. No pit zips was a concern, but since it appears that the Gortex Pro does what it is suppose to, it may not be a concern over time. Rated 5 out of 5 by Chris from Excellent This is my first Arc'teryx product and my first gore-tex jacket. My wife bought this as a great Christmas present. I just walked my dog in Seattle about a mile where it's 36 degrees in this jacket over a cotton t-shirt. I then used an infrared thermometer and the temperature of my bare forearm was 76. The surface temperature of the jacket sleeve was 63 degrees. I also wore this jacket in Guam two weeks ago to protect from rain and it was very breathable. Incredible. Rated 5 out of 5 by Nathan from Best layering jacket for rain or snow I use this jacket for spring/summer rain and then winter snow in Germany. It layers great and it always fits me even when over a sweater. I am a skinny person, so be ready for it to be snug if you are not. This jacket breathes, it's super light weight, and it really protects against water. Instead of having a larger jacket I just layer this on top for snow. Rated 5 out of 5 by DomL from A whole new category of garment. (This review is for the SS'14 jacket, made with Gore Pro). For me, there are two types of Arc'product. The first, fits into a category, 'generic, plus'. Take the Delta AR zip neck. A great piece, but not exactly ground breaking. It doesn't need to be. A simple, warm, versatile fleece top, the type of which many other manufacturers produce, just done that little bit better. Better fit, more durable, superior design. This jacket falls into the second category. In fact, the point is, in many ways, it defies categorisation. It's a REALLY lightweight shell - barely more than 300gramms, yet it's as durable and has all the essential features of year-round, all-weather shells that weigh double. It's a full-on mountain shell, but it's more, because of the lack of weight, the supreme breathability, (it is as breathable as my old eVent jacket), the reflective logos, the amazing packability, it could easily be used for biking, day hikes, even fell running. Put simply, no other manufacturer makes jackets like this. (Or are simply incapable of doing so). No other manufacturer makes a product so breathable, lightweight, packable, whilst still making absolutely no compromise on durability and quality of features. I use this piece for everything, from walking the dog to full-on mountain use. It works perfectly in either environment. To elaborate on the feature set, the hood is perfect and has amazing adjustability. Velcro cuffs are chunky and very sticky. The fit is perfection. I'm not sure I would categorise it as 'trim fit', personally. It fits very similarly to the Alpha LT, just a little less room in the waist and torso, which is ideal for this piece. It keeps the garment close fitting without being restrictive, but I could still easily fit my Nuclei Hoody and perhaps a fleece top on underneath. Only one pocket, which will be a drawback for some, personally I don't use hand pockets on a shell, so I don't miss them. The pocket provided is easily big enough to fit a map, phone, snack bar, gloves, and is well positioned. I've mentioned breathability - it really is the most breathable shell I've owned. Easily as breathable as my old Beta FL made from Gore Active and the two shells I've owned that utilised eVent. Given that this piece is made from Gore Pro, with it's added durability, that's a key feature. You can see (at least in part) how they did it - the inside of the jacket is a masterpiece of minimalist design. Tiny, tiny seams and flawless construction. All-in-all, an amazing piece. A true all-rounder, and my new personal favourite. Rated 5 out of 5 by atomreaktors from Love it ! Excellent jacket ! I own the red one, vibrant, rich color looks amazing. I'm 189cm, 87kg athletic build this jacket fits me perfectly, no bulk. When put into the pouch Alpha FL occupies very little space and can be easily stored in a backpack or clipped on a harness. I was climbing in temperatures around- 0 C only in a shirt and Alpha FL, felt very comfortable: wasn't freezing or overheating and there was no moisture build up inside the jacket. The jacket made me rethink what goes into my backpack in terms of clothing. In future ascents I might leave my fleece vest at home and save some weight as it's functions in a way overlaps with this jacket (as mentioned- felt warm in it) Have been using this jacket for 2 climbing seasons.